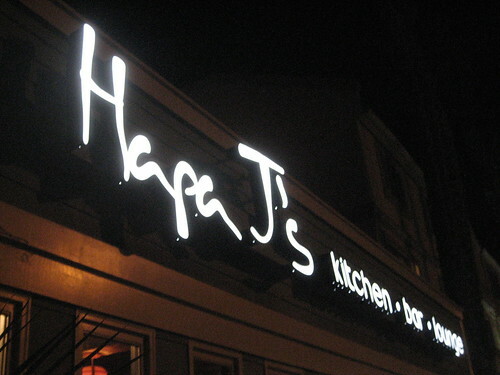 Hapa J’s – San Clemente, CA – Home of the Man Fries! 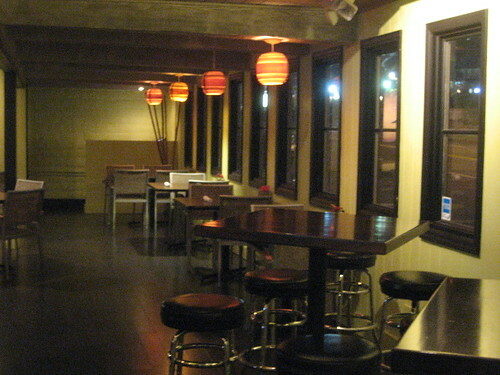 I first heard about Hapa J’s a few years ago through Tiki Farm. Back when the tiki mug company was still located in San Clemente, they organized a few dinner and drinks nights at the nearby restaurant. I hadn’t been able to make any of those events, but we decided to stop by on a drive back to LA from San Diego. 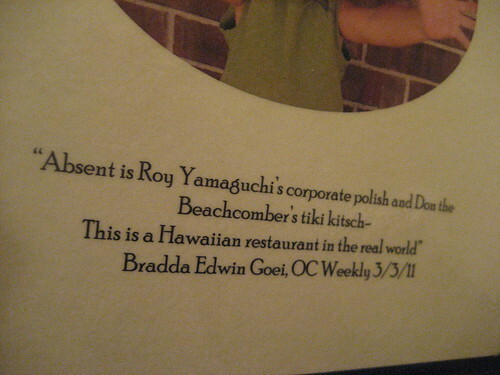 Orange County native Justin Shea opened this Hawaiian-inspired spot in 2009 with chef Aaron Lee at the helm. They had met while they were both working at the Moana Surfrider Resort in Waikiki. 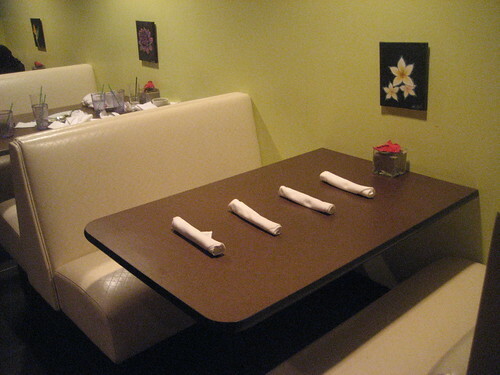 The restaurant was named in honor of Shea’s son, Jaedon, whose heritage is part Asian/Pacific Islander (a.k.a. “hapa”). It’s true, this is not a tiki bar. (Of course, I think it would be even better if it were.) 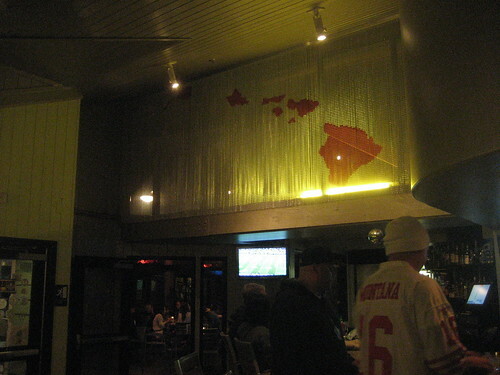 Rather, the decor is sleek and simple, though I would have liked to have seen a bit more island flair. 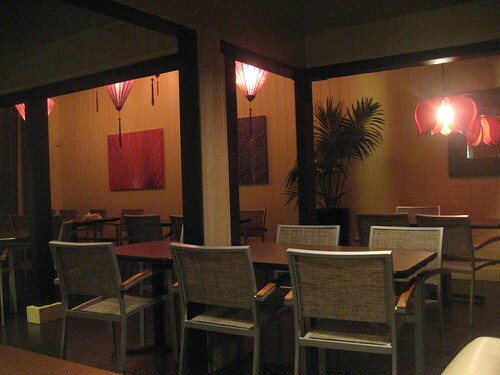 The best ambience seems to be in the lounge, which is on the left when you enter. 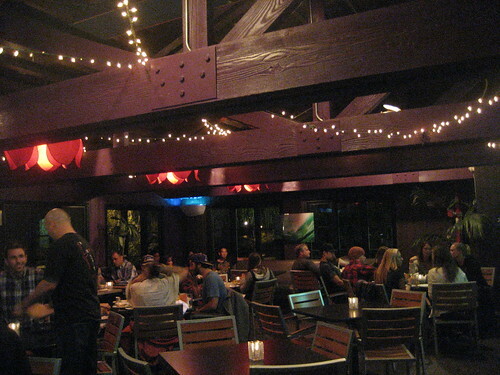 I liked the high ceilings, dark purple beams, red lotus lanterns and string lights. I imagine it’s also a nice setting during the day with all the natural light let in by the windows lining the three walls. 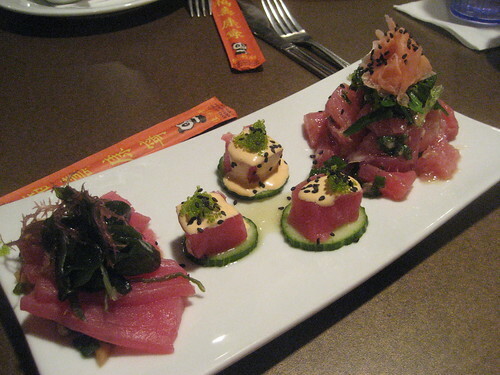 The food is described as a “fusion of Hawaiian, Asian and American cuisine,” with plate lunches, burgers and rice bowls for lunch and some fancier fare like macadamia crusted mahi mahi added at dinner. 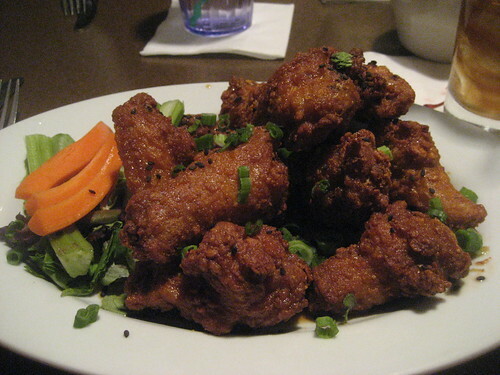 Most of what our party ordered was from the all-day starters (pupu) section, like the spicy Asian-style chicken wings ($9.75). MAN FRIES! 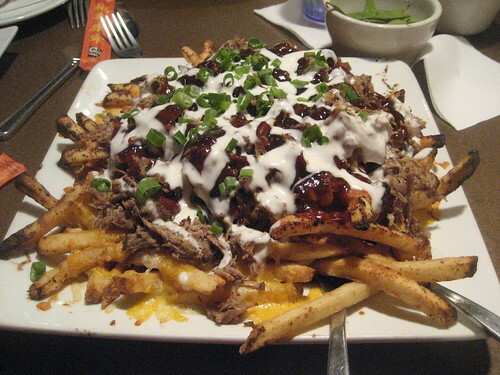 Probably the most notorious thing on the menu, these are the yukari-seasoned Hapa Fries ($6.75 + $6 for Man-style) loaded with cheddar and jack cheese, kalua pork, special wing sauce, ranch, barbecue sauce and green onions. The massive portion size can easily feed four people, but don’t be afraid of bringing home leftovers because they were even more flavorful the next day. 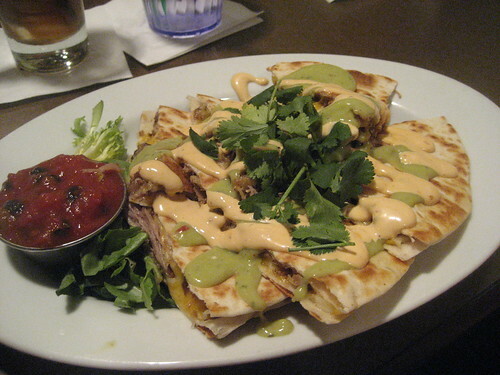 The kalua pork quesadilla is one of my favorites at Don the Beachcomber, and Hapa J’s version ($11.75) topped with avocado sour cream sauce and chipotle aioli is also really good. 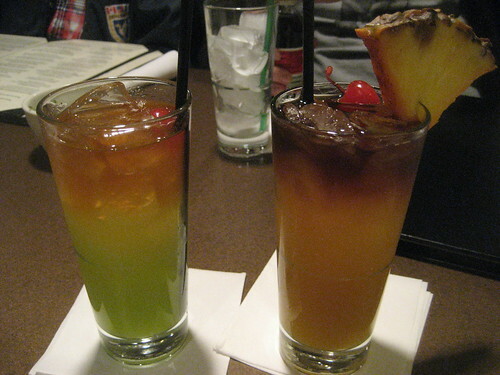 There are a few tiki-ish drinks among the cocktail options. While it may have a tough-sounding name, the Gravedigger is actually a sweet, rainbow-colored concoction of coconut rum, melon liqueur and pineapple juice, topped with Stroh 80 rum. The Rossy Boy Mai Tai tastes like a Hawaiian-style version; purists can request the off-menu “Old-School” Mai Tai which more closely resembles what Trader Vic intended. Happy hour is Wed.-Sun. 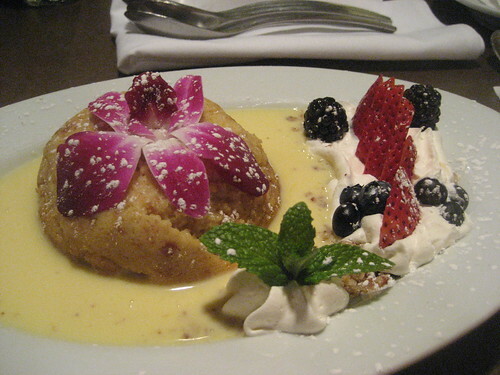 from 3 p.m.-6:30 p.m. with $2 off pupus (which include nearly all the dishes above), $3 drafts and $6 Mai Tais. There are also various specials throughout the week, such as Taco Tuesdays (with homemade corn tortillas) and Aloha Fridays ($3 Primo drafts all day and a Luau Plate with lomi salmon, huli huli chicken, haupia and more for $20).